There are lots of blogs out there, but not too many people blog about bugs. Fact is, bugs bug people. Birds bug bugs. Bugs bug bugs. If you've ever seen a praying mantis lying in wait for a bee or a ladybug snatching an aphid, or a dragonfly grabbing a hover fly, you know they do. Bugs bug bugs. In the insect world, people seem to love only butterflies, bees, ladybugs and dragonflies, as evidenced by bug-inspired clothing, jewelry or tattooes. They do not like bed bugs, knats and mosquitoes. When you think about it, there are about a million described species of insects in the world, "more than five times the number of all animals combined," according to emeritus professor Jerry Powell in his book, California Insects. "Estimates of the number remaining to be discovered and named vary from 1.5 to 5 million or more." We all talk about the good, the bad and the bugly. The good: the honey bee. The bad: the mosquito. The bugly: the praying mantis. 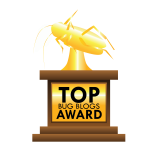 So it was interesting today that Organic Pest Control of New York City named the world's top 50 bug blogs/pest control blogs. You can see the list here. Geographically, they range from California to Singapore to the UK. "These sites were shown to have valuable, fresh and frequently updated content that is helpful in both entomology and the pest control industry," according to the website. At least two blogs have UC Davis connections. Biologist and noted insect photographer Alex Wild of the University of Illinois, who received his doctorate in entomology from UC Davis with major professor/ant specialist Phil Ward, is listed for his Myrmecos (that means ant) blog. The other blog with the UC Davis connection: yours truly with Bug Squad. Visit here for a blog by Illinois-based biologist and photographer Alex Wild. The blog's name is derived from the Greek word for ant and contains Alex's musings on the little creatures that share our planet. The galleries are a must see given Alex's love of both insects and his talent with a camera. Mike Merchant has served as entomology specialist for Texas AgriLife Extension since 1989. His areas of specialty involve research on the insects that effect people including spiders, scorpions, fire ants, termites, and others. Get pest control from an academic point of view by stopping at his blog. This blog is named after a quote from Joseph Krutch on the human standpoint on insects. Alison also fills her blog with other discoveries on insects and closer looks at them. Everything from ants to wolf spiders are featured. Because some bugs can be downright beautiful, there is this blog. Get a look at “nature's flying jewels” without ever leaving your home. With entries dating back to 2007, there are loads of butterflies to see. Jonathan Neal also has a Ph.D in entomology and teaches at Purdue University. His blog is devoted to the intersection of people and insects. Subjects such as fire ants, bees, and many more are often discussed. Ted C. MacRae is a research entomologist by vocation and beetle taxonomist by avocation. With entries on loads of common and uncommon household pests, his focus is of course the beetle. However, you can also find entries on items such as spiders, reptiles, and most recently, Bichos Argentinos. These bloggers standout for targeting their insect research and blog towards the largely ignored urban areas. Located in Wayne County, Michigan, they have recorded 50 new species of odonata, or dragonflies. Stop by to see which and learn more about them. 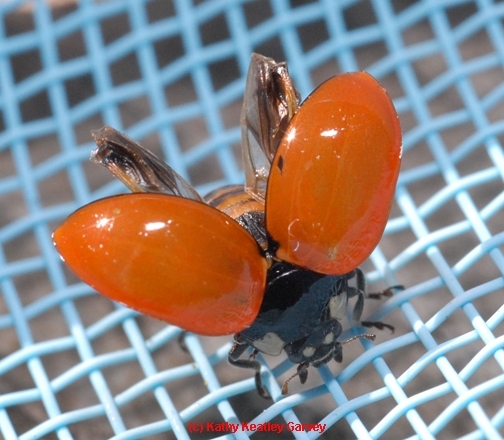 Bug Squad is the blog of Kathy Keatley Garvey, communications specialist, UC Davis Department of Entomology and Nematology. This blog, launched in 2008, is part of the University of California's Agricultural and Natural Resources website. Check for the latest research and other information. Also known as The Bugman, Daniel Marlos is the author of “The Curious World of Bugs.” With a healthy pest-free garden in Los Angeles, he is free to explore his love of bugs, as well as share useful pest control tips. Be sure not to miss specialty posts on just about every insect in the U.S.
And, be sure to check out the other winning blogs on the company's site. Back to the ladybug. It's not really a bug. It's a beetle. 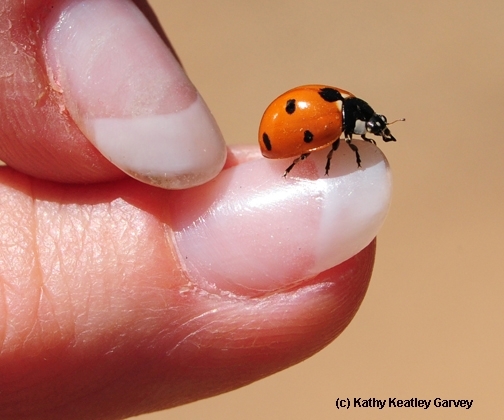 That's why scientists want us to call it "lady beetle." 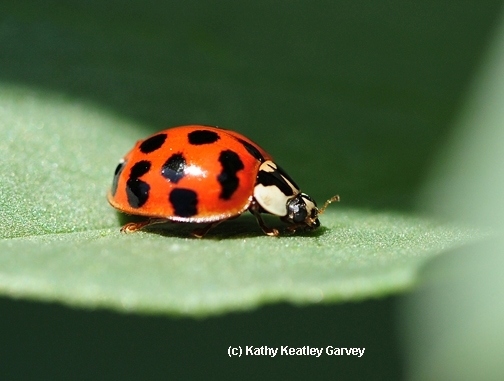 You can read all about the lady beetle in UC IPM's Natural Enemies Gallery. UC IPM defines natural enemies as "organisms that kill, decrease the reproductive potential of, or otherwise reduce the numbers of another organism. Natural enemies that limit pests are key components of integrated pest management programs. Important natural enemies of insect and mite pests include predators, parasites, and pathogens." Sometimes it's good to have an enemy, a natural enemy.